The Windows 8 Lumia range in 2012/13 had excellent design, good camera’s and helped start re-building the Windows Phone market, which was accelerated with the super pricing of the Lumia 520 that helped in more than one way to increase the Windows market share. However one thing was obvious, the hardware on these phone was pre 2012, yet Windows seemed more than efficient compared to Android that it helped smooth operations with rather mediocre hardware. The first phone to break this mold was the Lumia 1520, as it for the first time a Windows Phone 8 device matched the Android flagship phones on the hardware. However to the WP8 buyers the question was? Was this phone still better than the older flagship the Lumia 1020? Had Nokia (Microsoft) changed their focus on the top end camera performance on their flagship? However for Nokia and Microsoft it was clear it was not just about the camera, but also making the phone match the performance of the Android in the industry test, since many buyers tend to look at the media for their purchase decisions, and negative flak about the low end of the hardware, were dragging the Lumia image down. 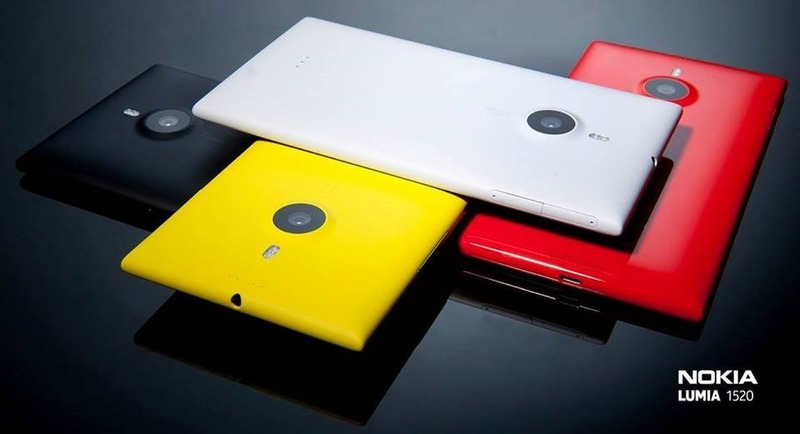 The Lumia range no matter what the phone had some form of the the dual-core Snapdragon S4 Plus Krait processor inside the phone until the the arrival of the Lumia 1520 (and the look alike lower budget Lumia 1320). The Lumia 1520 features the cutting edge hardware during its launch, featuring the quad-core 2.2Ghz Qualcomm Snapdragon 800 (Model: MSM8974, Krait 400 cores) processor, coupled with the Adreno 330 graphics, and 2GB of RAM. The android club might say only 2GB? when the Samsung flagship the Note 3 had 3GB. But if you have used Androids you know its one memory hog, though things have improved a bit after Kit Kat, however add the Android memory inefficiencies, and the heavy Samsung TouchWiz interface, and the additional custom apps the Note 3 brings in with the Stylus, you realize 3GB is a MUST! Step back and compare the Lumia with the other major mobile OS, Apple iOS. The flagship there the IPhone 5S (at the time of the 1520 launch) and even the latest Iphone6 and 6+ only have 1GB, so 2GB is more than enough for Windows, don’t compare apples to apples (no pun intended) since the mobile OS platforms and vendor customizations require very different hardware requirements. I have used the Lumia 520, 720, 820, 620, 920 and 1020, and got a chance to try the Lumia 1520 from a friend, and I immediately noticed the gain on the performance in general OS usage. One must also consider that unlike the older Nokia models with the Lumia 1520 the hardware has to handle almost double the pixels as it features a fullHD resolution (1920×1080) compared to older flagships that had 720pHD (1280×768). The resolution impact may not be noticeable in most apps due to the Windows big font approach however! First and foremost comparing devices on the same platform with the same tools maybe relevant in some ways, but when comparing against different platforms this can be totally meaningless factor. Reason is that how the operating platform behave, the optimizations, etc means the real performance you feel can be vastly different though the hardware might be the same. Take for example an Apple IPhone 4S, a Lumia 520 and any Android phone running a dual-core processor with 512MB memory, and I can say the Android phone feels really slow, but the other two devices are far more smoother. So keep this in mind and don’t purely go by benchmarks to say which is the superior device. Finding free benchmarks for Window Phone devices are not easy, and even paid once are not many. So seeing how well it performs against phones running other platforms are not easy for a blogger like me. One tool that has started proving some means of comparing across platforms is the Basemark OS II tool from Rightmark. Results shown are a combination of data extracted from the web, and my personal tests. The overall test one might say are give an usual picture showing the Nexus 5 and Lumia 1520 to have near equal results, and that makes sense when they are running nearly the same hardware configuration. 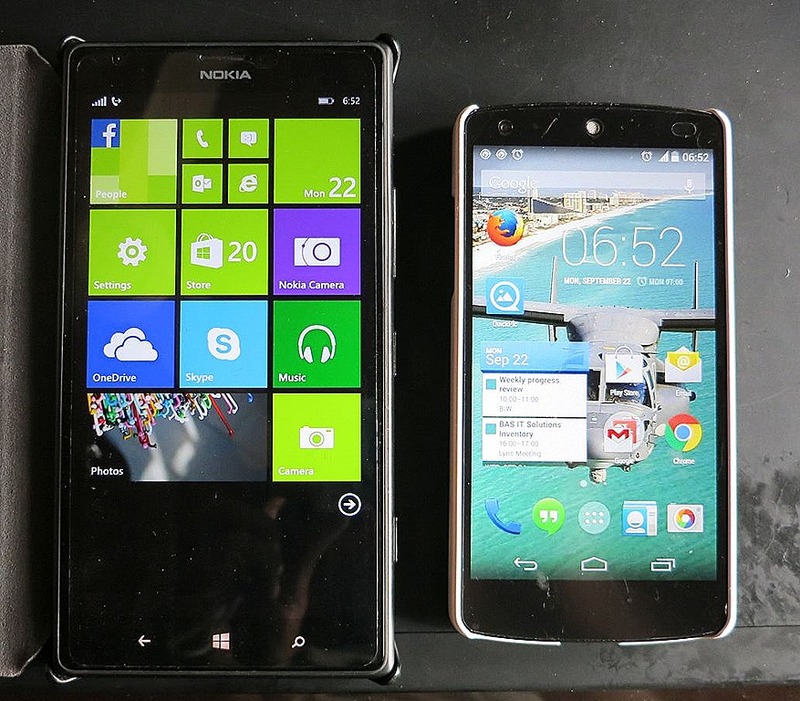 We also see the quantum improvement of the new Lumia 1520 compared to the older Lumia 1020. Also evident is that the lookalike Lumia 1320 (and the Lumia 630, both powered by Snapdragon 400 processors) is far slower, but match last year’s the Lumia 1020 flagship though they are running mid-tier hardware in 2014 terms. However the graphics test for Basemark provides is rather different, and questions the accuracy of the test. 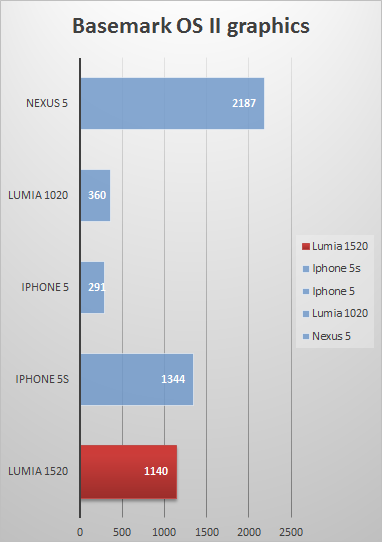 The chart below has the Nexus 5 roaring massively ahead of the Lumia 1520, and also ahead of the IPhone 5S. Once might say the Windows 8.1 graphic drivers and game engines maybe not as optimized as the Android version, but the Apple 5S pushes a lot less pixels, and has a very powerful GPU, so its quite startling. But the comparison of the Windows devices here makes sense, and see how much more powerful the Lumia 1520 GPU and CPU combination is compared to the Lumia 1020 (almost 4x times). A review of the Nokia 930 published in www.7tutorials.com uses the WP Bench app to test the Windows phones, shows the Lumia 1520 (and the 930) going neck and neck, and providing nearly a 100% (2x) improvement to the Lumia 1020 performance in graphics, memory and storage tests. Interestingly many had said the gain for Windows from better hardware was going to be marginal, but the performance gains of the Lumia 1520 over the 1020 indicates that WP8/8.1 performance does improve tremendously with better hardware, though performance gains from 1GB to 2GB memory have been marginal. One of the most favorite and still popular WP8 Lumia phones is the 925 for it classy design. The new co-flagship to the Lumia 1520 the Lumia 930 harks back to this design, but sadly the Lumia 1520 opted more for a plasticky feel though it has the strong and sturdy polycarbonate chassis. The worst is the red variant as it has a glossy body making it feel really cheap, however the other colors have a matte type surface similar to the Lumia 920, giving it a more refined and premium feel. The design though has very little novelties, and seems to be more functional. I like that they put the power button at the middle as it makes the phone operable with single hand thank to this design touch (something the HTC designers for instance missed out with the HTC butterfly I had sometime back). The SIM card and microSD slots have trays rather than simply inserting the devices which also gives it it a premium feel. Though the phone features optical image stabilization, it has a slim shape something that Nokia got right with the 925 and the same mantra is applied to the Lumia 1520. However the days the optical image stabilization was a Nokia feature is now gone, HTC and then LG joined in, and this year IPhone (with the 6+) and Samsung (with the Note 4) join the club, and they have even thinner profiles. The phone is large, and definitely a phablet and bordering a tablet, but heavy at 209g. However when you hold it, you will realize it does not seem to heavy compared to say the Lumia 1020. Weird when the 1020 is much lighter. This all boils down to the weight balance and design, as the camera hump on the Lumia 1020 definitely upsets the phone balance for normal use. I have the Lumia 1520 next to my Nexus 5, and you see the difference of what one calls a large 4.95” phone and the Lumia 1520! A phablet has to be large, and the Lumia 1520 (and the cheaper 1320) are Nokia’s first fling into the highly lucrative phablet market that Samsung got going with their Note series phones. The users of these devices mainly want to watch videos, play games, and hence the quality of the display is very very important. The prominent and very easily noticed aspect of the Lumia 1520 is its fullHD resolution 6” display. The Lumia 1520 moves away from the AMOLED type displays that were in the Lumia 1020 and 925, and moves back to a IPS LCD display, a Nokia ClearBlack type, a decision that seems to be favored by many due to the more natural colors of the LCD displays. The display comes with a protective layer of Corning Glass 2, unusual that it uses the older generation of this tech, when even the Lumia 1020 had Corning glass 3? Could this be a cost issue? The display also has the supersensitive touch tech (aka glove mode) which is something Nokia has been bragging with the Lumia range (and the only one to omit this surprisingly is the new Lumia 930). The Lumia 1520 display is also supposed to have something called Assertive Display Technology (got that from wpcentral.com) where each pixel is can dynamically adjust to the current environment, and this is unique to the Lumia 1520 currently. The display has good color representation, and decent legibility outdoors, and great legibility indoors. The display however is very reflective, and a matter screen protector may seem a good option if you are an outdoor user. While Nokia and Microsoft will like you to believe the camera in the Lumia 1520 is a match for the Lumia 1020, from a photographic perspective there have been improvements, but there have been sacrifices as well. To the purist this sacrifices are too much, and the Lumia 1020 continues to be the camera flagship in the market for those who want the best in photographs but also know how to use a device to get the best out of it (more on this later!). First compare the 1520 against what most would compare, the Lumia 1020. Immediately you notice many of the photography oriented features have been removed and moved mainstream. Xenon LED is out, the sensor is substantially smaller (the Lumia 1020 sensor is 67.5% larger than the 1520 sensor) and more similar in size to the market standard, the lens aperture is also smaller. Fortunately the Optical image stabilization has been retained Photography control is still very much available thanks to the Windows Phone OS that provides one capability still missing in the Android space which is the shutter control. 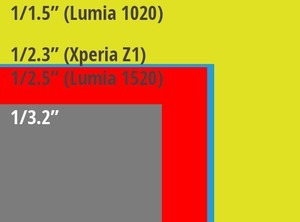 The difference in ratio to the Lumia 1020 sensor is shown below. While I am not an Apple fanboy, the native camera app for Apple phones may have very little control, with things improving with the new iOS 8 (which now features exposure control). However Apple iOS does support in its latest version many advanced photographic control capabilities similar to the Windows OS, which is harnessed by third party camera apps such as ProCam. My comparison table is with the native camera app, however expect some great camera apps for iOS 8 devices. The * in the apple column is to indicate that these are supported by iOS and third party apps currently do provide this capability for iOS devices. However now compare the Lumia 1520 against the flagships of 2013/14 and you see its now a match or slightly superior to the rest of the competitors, making sure the Lumia 1520 remains one of the best camera smartphones in the market, but compared to the Lumia 1020 is definitely less cable for an photography enthusiast. You will also see that the Nokia 930 features the same photography specs as the 1520, which means the Lumia 1020 replacement is yet to come (well looks like Panasonic may have brought the replacement, as their latest smartphone the DMC-CM1, the phone having the model number more akin to a Panasonic camera has the largest ever sensor on a camera, featuring the 1” sensor found in most pro cameras such as the Sony RX100, Nikon 1 and Canon GX7). 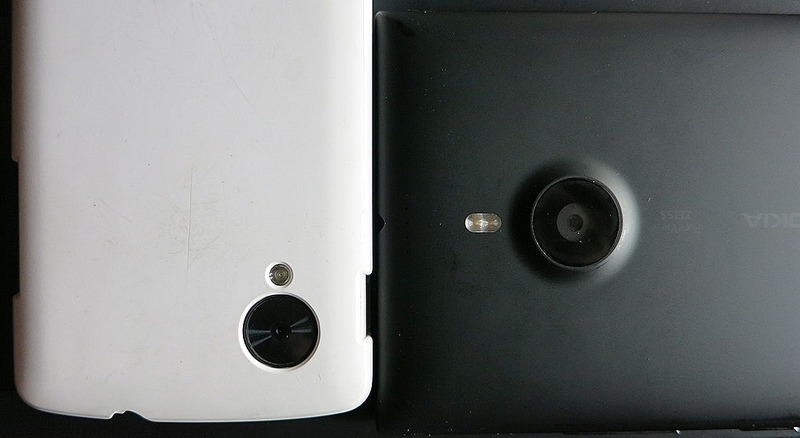 The picture below shows the Lumia 1520 camera lens and the Nexus 5. I have a Lumia 1020 prior and found that it takes very good photos to match a decent point and shoot digital . The Lumia 1520 is good but still not in the same league of the Lumia 1020. One of the biggest pain points of the 1020 has been the significant lag, as the entire processing of the image is done using the phone hardware (not specialized image chip like in the 808). The Lumia 1520 features much more powerful hardware, and hence the lag is much less. However if you have used an IPhone or a top Android phone you will notice the Lumia 1520 is still not as fast when its capturing images. The chances of focusing and getting the shot right are rather poor even with the Lumia 1520. Improved low light algorithms to get even better picture quality. If you read many reviews of camera comparisons of phones, one thing becomes obvious. The best hardware, and most featured camera app alone is not going to make your phone the best camera app. There is a lot more, for those who like to click and have the device do the thinking (in digital cameras we call this the auto mode), the IQ of the camera logic is vital. Importance factors include the way the camera metering works, the speed of the focus lock, specially under low light situations. You will also notice that the focus of HTC and Apple has been different in the camera department, as they have avoided the megapixel game, and opted for a larger pixel size to allow more light per pixel. HTC with a 4MP version sadly may have gone with too low a resolution, but Apple seems to have picked the correct spot with the 8MP resolution. However unlike the samsung phones, the Lumia phones with Pureview use what is called downsampling where the photos are taken at full resolution and with something called pixel binning scaled into a smaller (usually 5MP) version that results in a super sharp image (if the focus had got it right that is). This has been and continues to be the area that Apple still takes the cake, as it provides possibly the best camera app for even the dumbest of users to end up with good photos. Samsung comes a close second is my opinion. Nokia has great cameras, the camera app in Windows is super featured, but in auto mode you may say that the photos are not that great, even with the Lumia 1020. You really need to make use of those settings to get great pictures, and for many this a bit too complex is my opinion, and an area that Nokia / Microsoft needs to put some serious work into. My current phone is a Nexus 5, not a great camera phone but a decent one, but I can take much better photos (though they may not be that great in sharpness) than the Lumia 1520, though the Nexus 5 has much less capable photography specs and the google camera app lacks many of the advanced features. The Lumia phones have always done well in the audio department, and the Lumia 1520 extends this. The large size helps to host larger speaker presumably because the audio is loud and clear on speakerphone mode. Call voice quality on the earpiece is also great. Since I do not have any fancy tech to validate my opinions I switched to GSMArena to see how they rated it, and yes the ratings are good to excellent, not the best but among the best. Surprisingly the audio scores for the loudspeaker for ringing tone (= music on the speaker) are lower than some smaller phones (including the Nokia 720), however the loudness of sound for voice is very good (which was the area I noticed, and good to see the scientific test confirm this). This was also one of the key selling points of the Lumia 1520, as it includes a massive 3400mAh capacity battery, and the battery endurance test for this phone was at the top in the GSMArena test, and still continues to be among the top in 2014. The larger battery is definitely required for a massive display of this size, but thanks to the much more efficient chipset combined with the large battery the Lumia 1520 is one of the few smartphones that can guarantee you a full day operation at minimum, something most smartphones would struggle even with smaller displays. However the GSMArena battery test are not really enterprise class, as in it does not mimic enterprise users who are very intensive phone users (you usually say gamers are intensive users). I will update this post with feedback from my friend who will be using the Lumia 1520 as his work phone switching from a traditional blackberry. Lets see how he feels of battery performance of Lumia 1520. Update1: My colleague has been running the phone for two days, full time on wi-fi at work, and is easily seeing the phone being able to last 2-3 days. I am waiting to see how the full data mode usage feedback will, but its looking very positive. Problem 1 : I upgraded from Windows 8.0 (Nokia Black) to Window 8.1 (Nokia Cyan), and hit a major problem!. After the upgrade I could not get the extra tiles, and could not find this option in the start+Theme setting. Turns out the ability to configure the number of tiles was only available in the 8.1 Developer Preview, and is now a default option for Windows 8.1 release edition. However my problem was that what was the default setting was not appearing. Turns out this can happen, and the solution.. yes.. wait.. do a reset of the phone.. yes a full reset. Tried it, and yes magic ! the extra tiles were there without a fuss. Seems the upgrade process does not do all the upgrades properly and you may need to do this to make sure you phone is all well. Problem 2: This was a biggy, I could not get data to work at all, no matter what. Though I gave the APN settings of my provider it keep saying DNS error. I tried resetting again but with no success. I then downloaded the Microsoft Access Point app, which was one solution listed in the forums, but found that this does not support Windows 8.1 release edition. Turns out the problem was that with 8.1 you need to ensure your SIM is provision by the telco provider, as the settings are picked by the provider. With Windows 8 I had no problem, so in case you hit this problem speak to the telco provider to provision your SIM first. Lumia 1520 or other? My choice…. 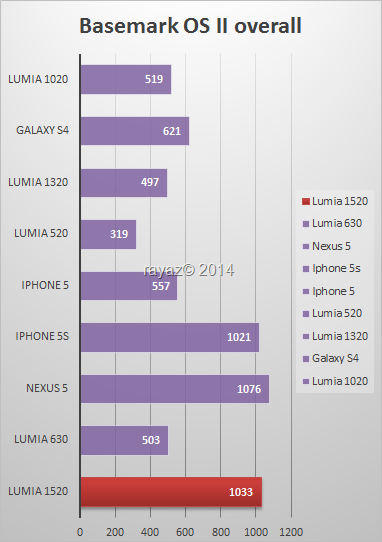 If you are buying the Lumia 1520 for its camera, I say also look at the competitors from Android and iOS. Specially the Note 3 and the upcoming Note 4, and the IPhone 6+ since they may even offer better capability since the Lumia 1520 has been cut down too much. However one place the Lumia 1520 seems to have a great advantage is on the battery endurance. For the purest camera capability currently available get the Lumia 1020, even if its supposedly at the end of life by this year (which also means its not going to get any new updates from Microsoft). To me the Lumia 1020 still remains a favorite, and still question the Nokia team why they launched the Lumia 1020 with the slower chipset when they could have done better and made the Lumia 1020 a stunner. However if you want a big display phone with great features with great battery life, the Lumia 1520 is one of the best options and I might say one of the best phablet devices out in the market, with the Samsung Note 3 maybe taking the overall crown (if you consider the stylus as a need). Things will surely change with emergence of many phablet products in 2014, led by the IPhone 6 Plus (assuming the screen bending issue does not cause a drop in sales), but to me it will be the Note 4 with its astounding spec that will surely be the new benchmark. However the Note 4 and IPhone 6 Plus will be priced over two times of the Lumia 1520, and that to me makes the Lumia a hot buy now more than the time of its launch. In case you find the 1520 great, but a bit too large, the Lumia 930 its co-flagship with same tech but in a slightly smaller profile, and far more premium build feel is a solid but pricey alternative, though the strongest challenger maybe the recently launched HTC One M8 Windows phone version that is looking to be an excellent prospect.